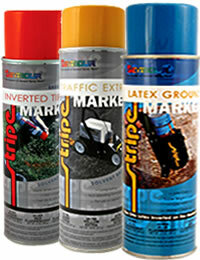 The two basic types of liquid marking paints are Water-Base and Solvent-Base. Both of these types have multiple formula varieties within them, and both of these types have their advantages and disadvantages. These are typically 100% acrylic emulsions (latex) and are recommended for use over newly placed asphalt or fresh sealcoat. These marking paints are typically a higher-viscosity, heavy-duty paint designed for higher performance and more versatile temperature installation variances than water-based paints. 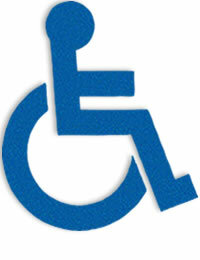 Thermoplastic is a pavement marking material that is a 100% solid, environmentally and user safe compound. A mixture of glass beads, pigments, binder, and filler materials, thermoplastic, as its name suggests, becomes liquid when heat is applied. 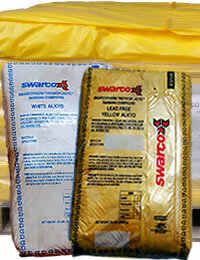 Hot applied thermoplastic is prepared in a melting kettle where the granular material is heated until it liquefies at temperatures exceeding 400° F. An agitator keeps the thermoplastic blended until it is transferred into a screed, ribbon or spray device where it is then shaped into its specified width and thickness as a line, legend or symbol. Glass beads are immediately applied to provide initial retro-reflectivity. Preformed Thermoplastic is a durable pavement marking system where thermoplastic lane lines, legends and symbols are supplied pre-cut and can be easily installed without specialized equipment. Preformed thermoplastic pavement marking material combines the convenience of pre-cut markings with the performance qualities of hot applied thermoplastic. Engineered for enhanced visibility both day and night, preformed thermoplastic pavement markings are made with SWARCO‘S brilliant glass beads which are distributed throughout the material during the manufacturing process. 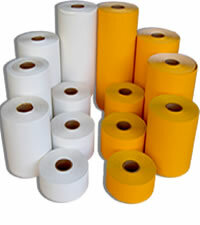 3M Marking Tape has a full line of durable, highly reflective pavement markings, pavement marking tape, raised pavement markings, primers, adhesives, and application equipment for all types of permanent and temporary roadway marking applications. 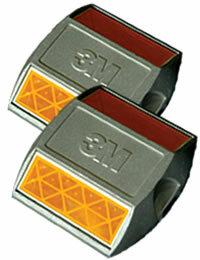 Designed to guide drivers clearly at night as well as in daytime. 3M's full line of high-quality temporary pavement marking materials includes pavement marking tape for markings that will require removal, and black line mask for temporary cover-up. Raised pavement markers (RPMs) are durable, highly reflective markers used for longitudinal lines and gore markings on new and existing asphalt or concrete road surfaces. 3M raised pavement markers are made with 3M™ Diamond Grade™ prismatic optics for maximum reflectivity, are lightweight and impact resistant and available for both sun country and snowplow regions. 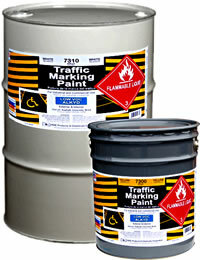 Roadzilla® MMA, the amazingly durable marking system is outperforming almost all other paints on America's roads. Rather than repainting your zone markings every year or two, Roadzilla gives you longer-lasting protection. There's no need for expensive application equipment...RAE offers a modified 1:1 Graco Hydraulic Sprayer for under $20k. Plus, it cures fast...you're open to traffic in just 20 minutes! 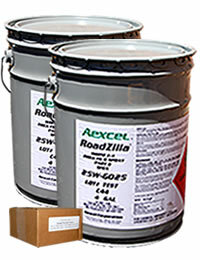 Roadzilla® 1:1 MMA is a 3-component system (part A, part B, & catalyst), where the powdered catalyst (BPO) is added directly to the part B side prior to painting. After the catalyst is added, the system then becomes a 2-component spray system. Aerosol Marking Paints are formulated to address today’s environmental concerns while providing efficient and dependable performance in a wide range of marking applications. From utilities and construction to recreational and maintenance applications we have a product suited to your needs. 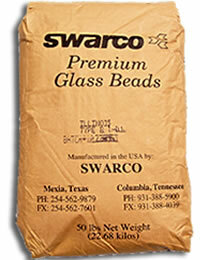 Glass Beads Leading edge glass bead and reflective technology.Swarco Beads provide improved rounds and smoother bead surfaces. 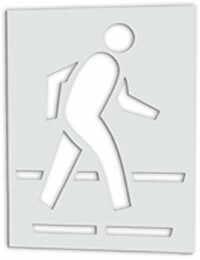 RAE’s Stencils are made from tough, flexible Low Density Polyethylene (LDPE) plastic in 1/16” (Duro-Last) and 1/8” (Maxi-Last) thicknesses. Try the Duro-Last for occasional use, and the Maxi-Last where a heavier-duty stencil is needed. The Maxi is a flatter laying stencil and geared more to the professional contractor, allowing for years of repeated uses.